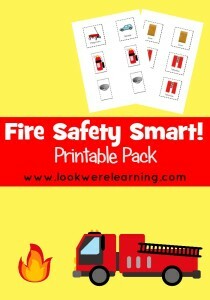 Fire Safety Printables for Kids - Look! We're Learning! According to the National Fire Prevention Association, some of the most important aspects of fire safety planning are testing the home smoke detector and developing a home fire escape plan. A fire escape plan should include the rooms in your home and the route that the entire family will take to escape in case of fire. Since fires often break out without warning, it’s critical that families decide on an escape route in advance and practice evacuating the home. In honor of National Fire Safety Week, I’m thrilled to announce the release of our newest printable pack: Fire Safety Smart! 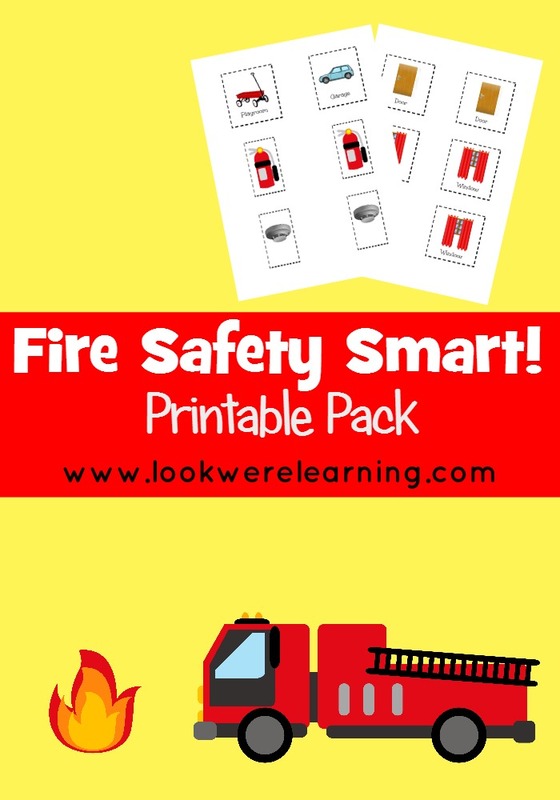 With this pack of cut and paste fire safety printables, you can get the kids in on the fire safety planning for your home! Fire Safety Smart! is designed to help kids learn the layout of their homes and to help develop the best escape route from the house. With the pack, you and your kids can do a walkthrough of the home to identify all of the rooms. Then, you can decide which direction the entire family will go to meet at a safe place outside the home. Since the pack includes cut and paste cards for common household rooms, you can use it to teach fire safety, practice scissor skills, and basic reading! Fire Safety Smart! is now available in our store for instant download for just $1.99! Click the image below to visit our store and download your Fire Safety Smart! pack. For even more fire safety lesson ideas, visit Ready.gov’s page on fire safety or read the following books with your kids! This post is part of the “Fire Safety for Kids” linkup! Visit our fellow bloggers for more great fire safety ideas for kids! I almost forgot we’re coming up on fire safety week! I’m in denial that it’s almost October. Thanks for the reminder… and thanks for sharing this great set of resources! Thanks for the reminder! I need to make sure we check the smoke alarms next weekend. These are wonderful! Thanks for participating in the blog hop! A great set of resources – thanks for sharing.